The LEMHH software stack is a group of software that can be used to serve dynamic web pages and web applications. This is an acronym that describes a Linux operating system, with an Nginx web server. The backend data is stored in MySQL and the dynamic processing is handled by HHVM. In this guide, we will demonstrate how to install a LEMHH stack on an Ubuntu 14.04 server. The Ubuntu operating system takes care of the first requirement. We will describe how to get the rest of the components up and running. 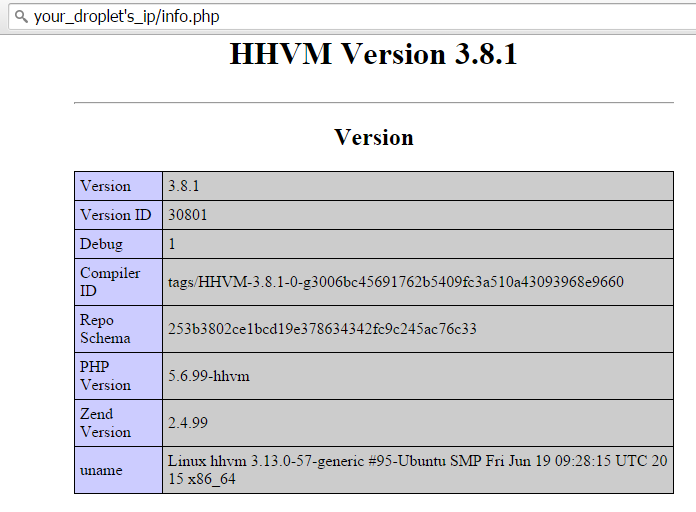 HHVM is an open source virtual machine for executing PHP and Hack code. HHVM is developed and supported by Facebook, a fact which draws more and more attention to HHVM lately. HHVM is different from other PHP engines because of its just-in-time (JIT) compilation approach. HHVM compiles PHP code into an intermediate byte code and then directly into x64 machine instructions. This allows more optimizations and higher performance compared to the way other engines work. HHVM is powerful and fast, but it's also demanding in terms of resources, just as any other virtual machine (e.g. JVM). Thus, HHVM requires more RAM and CPU in comparison to other more lightweight PHP interpreters such as PHP-FPM. Our tests showed that decent performance requires a Droplet with at least 1 GB RAM. In this article we'll show you how to install Nginx and HHVM. Before you complete this tutorial, you should have a regular, non-root user account on your server with sudo privileges. Once you have your account available, sign into your server with that username. You are now ready to begin the steps outlined in this guide. This guide has been tested on Ubuntu 14.04. The described installation and configuration would be similar on other OS or OS versions, but the commands and location of configuration files may vary. All the commands in this tutorial should be run as a non-root user. If root access is required for the command, it will be preceded by sudo. All of the software we will be getting for this procedure will come directly from Ubuntu's default package repositories. This means we can use the apt package management suite to complete the installation. In Ubuntu 14.04, Nginx is configured to start running upon installation. You can test if the server is up and running by accessing your server's domain name or public IP address in your web browser. You will need to enter the MySQL root password that you selected during installation. Next, it will ask if you want to change that password. If you are happy with your MySQL root password, type "N" for no and hit "ENTER". Afterwards, you will be prompted to remove some test users and databases. You should just hit "ENTER" through these prompts to remove the unsafe default settings. Once the script has been run, MySQL is ready to go. When run, this script adds the configuration file /etc/nginx/hhvm.conf to the default Nginx server block configuration /etc/nginx/sites-enabled/default. It works only with a default Nginx configuration without any FastCGI configurations. The above means that Nginx should use HHVM to process any .php or .hh (hack) requested file. In the above configuration you may notice the variable hhvm.server.port which determines that HHVM will be listening on TCP port 9000. Furthermore, unless otherwise specified, it will listen on localhost by default. HHVM is considered for environments under heavy load so the first configuration change you can do is to make HHVM listen to a socket instead of a TCP port. Thus, the communication between Nginx and HHVM will require less CPU and memory. The first test you can perform is with the PHP command line interface (cli) /usr/bin/php which points to /etc/alternatives/php, which in term points to the HHVM binary /usr/bin/hhvm. Next, you can use the well-known phpinfo() function to see HHVM's settings and options. For this purpose create a new file called info.php inside your default document root — /usr/share/nginx/html with your favorite editor. Now try to access this file at your Droplet's IP. The URL to put in your browser should look like http://your_server_ip/info.php. If you don't see a similar page then first make sure that you have followed correctly the installation instructions from the prerequisites. Second, look for errors in the error log of Nginx (/var/log/nginx/error.log) and HHVM (/var/log/hhvm/error.log). Going back to your browser, you may notice that this page is similar to the one produced by phpinfo() with the usual PHP. In fact, most of the variables are identical to those from the usual PHP with the exception of the HHVM-specific variables starting with the hhvm. prefix. While exploring the variables note that memory limit is equal to 17179869184 bytes which is a little bit over 17 GB. Such a high memory resource limit will certainly kill a Droplet with a few GB of RAM, making it unresponsive. You should decrease this value to a value lower than the available RAM of your Droplet to ensure that other services on the Droplet will not suffer from lack of RAM. Next, you can perform a more complex test with a common web application. It's important to know that HHVM is not 100% compatible with the usual PHP nor with all popular PHP frameworks. Our tests during the writing of this article showed that many PHP web applications, such as WordPress, seem to work fine. However, officially, the number of supported frameworks is limited. When you test with a complete framework/web application there should be nothing HHVM-specific to consider. The installation and operational instructions should be the same as for a regular LEMP stack. This is because, by default, HHVM comes bundled with all most PHP modules providing good compatibility. Still, in some rather rare cases you may need to install an additional module for HHVM. For example, if you use PostreSQL as a database server you will need the pgsql module. In such cases consult first HHVM's official documentation even though it may forward you to a third party resource, such as in the case of pgsql. As this article showed, HHVM can be easily installed, configured, and integrated with Nginx. If you have enough resources you should definitely give it a try and see how HHVM's unique JIT compiler works for you in terms of performance and stability. There must be a good reason for a site like Facebook with complex functionality and unmatched traffic to trust it. However, for smaller sites with less traffic you may find a lower memory footprint solution such as PHP-FPM still a better choice.